Need a good target practice ammunition from a trusted leader in the industry? 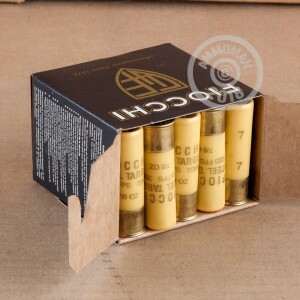 These 20 Gauge Fiocchi Low Recoil loads will do the trick! Fiocchi was one of the first manufacturers to offer performance-specific low recoil targets for shotgun shooters. This product will deliver a powerful shot with far less kick, preventing shooter fatigue. 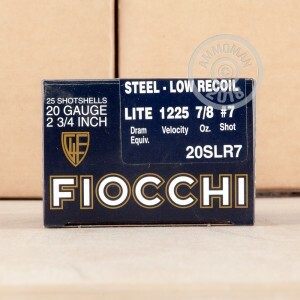 This Fiocchi ammo features a 20 gauge 2 3/4 inch shell, loaded with 7/8 ounce of #7 steel shot. The velocity of this load is 1225 feet per second. The Fiocchi family began offering quality ammunition in 1876. So many years later, the company still remains family owned. Their proven reliability and consistency for delivering great products makes Fiocchi a big name in the ammunition industry. Order your 25 rounds today!